Happy day after turkey day and Black Friday!!!! I hope my US friends had a wonderful Thanksgiving! 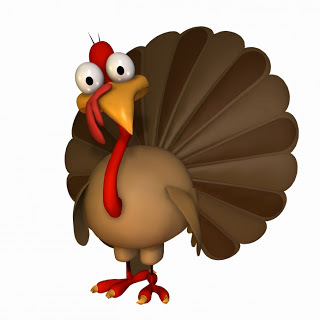 Some of you may still be in somewhat of a turkey coma and others of you actually braved the shopping malls today! Ya know....that leftover turkey leg that no one wanted makes a really effective weapon in a crowd or parking lot........keep that in mind!! I only left the house today to get cold medication and groceries. I am probably the only person in the entire world that needs to grocery shop the day after Thanksgiving. I have 5 hungry boys.......there is no such thing as leftovers in this house........ever!! Kroger was a breeze........because everyone was at the mall. Including my nutty son Jacob and his g/f Chloe. They decided it would be "fun" to hit the mall on Black Friday. So far no calls from the police or hospitals so I am assuming the are doing OK I finished a huge chunk of my Christmas shopping today by surfing the online black Friday deals. I got an awesome deal at Aero....they had a lot of their tees for $5 each.......regularly 20 something. I bought several of those and hoodies AND jeans for all the boys and managed to spend under $100. I also lucked into a couple of the Amazon lightning deals on video games.......and my son Steven has a friend at school that bought Call Of Duty Black OPS the day it came out, beat it the next day and wants to sell it for 20 bucks. SCORE!!!! Now I am settling down in my PJ's blogging, taking care of a couple of projects due this weekend and then I am doing some scrappy black Friday shopping for ME!!!! Things have been a slow the past couple of challenges at Digitally Sweet. I know the holidays are a super busy time. Just know that when you are ready to lock your doors and change your name from "MOM" to something no one could even pronounce in a million years and take a deep breath and do some scrappin.....we'll be here!! Poor fella!! I keep seeing this flashing neon sign over his little head that says "Eat more ham!!" You can go the obvious route here and do Thanksgiving or gratitude themed projects.......or use the colors.....whatever this sparks in your imagination!!! Now the first photo was taken without his knowing it...........and the second is when he noticed a camera in my hand........whatta turd!!!! Obviously I used the turkey as my inspiration to scrap my own turkey :) And the little turkey in this digi kit was just soooooooooo stinkin cute!!!! All of this was put together with this killer collab kit from After Five Designs. So.......have I tempted you to play along?? We'd love to have you join us!!! Be sure to visit the blog because this week our team has really outdone themselves and created some projects that have made my jaw hit the floor!!! I'm thrilled to be on a team with such a talented group of gals!!! I'm also linking up at the following rockin blogs, parties or challenges!! Joyful Stamper Inspire me Fridays,,,,,,,Anything Goes!!! Your lo is ADORABLE!! LOVING that turkey!! And what a SCORE on the video game!!! Like your whimsy adorable scrapbook layout. Kids will be kids. Fun memories. Thanks for entering Pause Dream Enjoy Anything Goes. Ok..so share the Butterfinger Recipe will you...quite teasing, lol! Tina: Your collage is so cute! Thank you for joining in our birthday celebration & Challenge #27 - "Give Thanks" at Simply Create Too. Fabulous layout with such a great sentiment. Well done! What a COOL kit you used on this Awesome LO! Those pix are just Adorable! Too funny!!! Oh, I forgot my A+! Your creations always inspire me - love what you do Tina. LOL!! Your posts always make me laugh. Love it and omgoodness, look at that whip cream! Did you have to peel him off the walls?? LOL! Reminds me of my daughter, she would do the same thing!! So, share the recipe now .. come on!!! GREAT LO this week, Tina! Love that little turkey. Thanks for joining PDE Challenges this week.